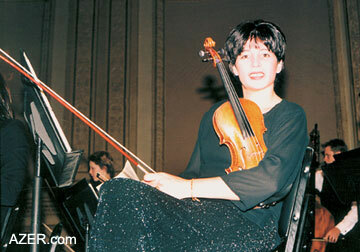 In the fall of 1999, violin virtuoso Sabina Rakcheyeva (1976- ) became the first musician from Azerbaijan to be enrolled in the prestigious Juilliard School of Music in New York. Since then, she has performed throughout Europe and the Americas with the school and the UBS Verbier Festival Youth Orchestra. Her stops have included Switzerland, Italy, Spain, England, France, Canada, Mexico, Brazil and Argentina. Since Sabina is most likely the one Azerbaijani student who has had the most exposure to so many other countries, we asked her to reflect on her experiences of studying and touring abroad these past three years. Performing in New York is something incredible, something unforgettable. Knowing that such a broad spectrum of people are so intent to listen has given me freedom to express myself as never before. It's very difficult to explain in a few words what it's been like to be away from my country, my family and friends and the people who know me. It takes time to understand these transitions and to appreciate the advantages and disadvantages. I found the educational process to be very different at Juilliard as compared to what I was used to back home in Baku. Right: One of Azerbaijan's most promising violinists, Sabina Rakcheyeva, just completed her Master's degree at Juilliard School of Music in New York City. Here she performs at Carnegie Hall. The first year was difficult - I'll have to admit. Of course, I had read about Juilliard and knew that some of the greatest musicians of our time had graduated from there. I associated Juilliard with Van Cliburn, who had won the first International Tchaikovsky Competition in Moscow in 1958 and who is still remembered for his concerts in Baku in 1960. But I had no idea how the school was structured. I thought it would just be a performing experience for me. It surprised me to learn that Juilliard is quite like regular academic institutions, with a strict grading system and attendance policy. Believe it or not, it was a big surprise for me to find out that attending classes would be necessary for fulfilling all of my requirements. I was shocked to learn that I would have to get special permission from the Dean in order to miss classes, even when I was involved in an important performance. Surprisingly, some of my friends had to forego some competitions because they didn't dare miss class. It's been hard learning how to establish my own network of friends and colleagues. New York is extremely competitive. In fact, even now, after three years, I find this to be one of the most difficult aspects about being here. One of the most disappointing experiences for me in the United States (until I got used to it) was being asked, "Where are you from?" It's the first question people tend to ask if you live in New York City, since it is one of the most international cities in the world. I didn't mind telling people that I was from Azerbaijan; it was their reaction that bothered me. You can't believe where people thought Azerbaijan was located - Western Europe, Asia, Siberia and even Africa! I often wondered what my sister who teaches geography at Baku State University would have thought if she had heard their answers. I found it very humiliating. By the end of the first semester, my patience had worn thin, and I found myself reacting in such a strange way. I wouldn't wait for people to guess where Azerbaijan was. I would interrupt them, and then I found myself apologizing: "Oh, I'm so sorry, here in the U.S., people don't know much when it comes to geography!" I don't know why I became so defensive. Maybe on a certain level, I was trying to vouch for my own existence. Even though Azerbaijan's culture goes back several thousand years, so many people have never heard of it. But they did seem to know our closest neighbors - Georgia and Armenia. Maybe it has to do with religion, or maybe it's because Azerbaijan lacks a strong and influential lobby here in the States. My mom and I have had long conversations about this. She never tires of repeating, "Azerbaijan's strong and powerful lobby starts with each one of us trying to do something and not waiting for a miracle." Once I got used to life at Juilliard, I realized there were so many positive aspects to education here. For example, graduate students get to choose their courses, which makes students' lives much more interesting. It also strengthens the relationship between students and teachers, making it more congenial. Of course, selecting your own courses is the norm here in the States, but in Baku it hasn't happened yet in the Music Academy. Juilliard also offers important classes to build one's musical career, such as "Career Skills Seminar" and "The Business of Music." These days you have to be more than a good musician to be successful. You must create your own network, find connections, speak in public, book concerts and know how to write a resume. We're missing these very important practical aspects of training in Azerbaijani universities. Here there's such a great respect for chamber music. In fact, I've discovered that in the United States and Europe, chamber music is one of the most popular forms of classical music. Here at Juilliard, at the beginning of the school year, students get together just to sight - read chamber music and form groups. As the year progresses, students get a chance to work with members of the Juilliard String Quartet and the distinguished musicians who perform as Juilliard's guests. At Juilliard I participated in numerous student events, including cultural presentations, musical performances and cultural awareness programs. Each year we have an International Festival, which is an amazing feast of world cultures joined together in an extravagant evening of performances and great food, with representation from each participating country. There are at least 20 to 30 countries represented here among the student body of Juilliard. There's an especially large Asian "lobby" at school - in fact, there seem to be more Korean, Chinese and Japanese students enrolled at Juilliard than there are Americans. Since the collapse of the Soviet Union, more students are coming from Eastern Europe. I'm the first - but hopefully not the last - student accepted from Azerbaijan. I'm trying to introduce and represent our country as best as I can. I'm amazed at the response when I play mugham arrangements for violin or other classical pieces by composers such as Gara Garayev, Fikrat Amirov and Musa Mirzayev. I didn't expect that audiences really would "get" Azerbaijani music, since it's quite unfamiliar. But especially here in New York, audiences are accustomed to hearing completely different styles and approaches. I've found them to be very open to new and unknown music. The language of music, indeed, does transcend time and place, regardless of distance, and somehow it has the ability to awaken genuine interest in people's hearts towards unknown cultures. I've been so fortunate to be able to see so many countries because of my musical experiences. I've played with the Verbier Festival Youth Orchestra, three years in succession - 2000, 2001, 2002. Verbier is considered the most prestigious youth orchestra in the world. It is supported by the United Bank of Switzerland (UBS) and takes place annually in a tiny town in the Alps. It's great to be among some of the world's best musicians and conductors in a beautiful natural environment. Last year the orchestra was made up of 110 musicians who came from more than 30 countries in Western and Eastern Europe, Asia, North and South America, Australia, New Zealand and the post-Soviet countries. They're mostly students, all between the ages of 17-29. This year we'll be performing June 24-August 8 in Switzerland and then November 7-29 in Europe. The November concerts will be conducted by James Levine and Mstislav Rostropovich, the world-renowned cellist, who happens to be a native of Baku. See www.verbierorchestra.com for more concert details. Verbier gave me the chance to work with world-class musicians like pianist Martha Argerich, violinist Vadim Repin and top conductors like James Levine, Zubin Mehta, Yuri Temirkanov and Wolfgang Sawallisch. And then we had the chance to travel to countries like Switzerland, Italy, Spain, England, France, Canada, Mexico, Brazil and Argentina. Performing in New York's Carnegie Hall, Berlin's Philharmonica and Buenos Aires' Theatre de Colon is something I'll never forget. Recently, I collaborated with a well-known Chinese-American composer named Bright Cheng. I performed his piece for violin solo called "Stream Flows", which is based on a typical Oriental tune. I was surprised to discover that he had some knowledge about Azerbaijani music and composers; he even asked me to play some mugham. The concert was featured on Voice of America (VOA) radio and U.S. Government TV and will be released as a documentary. Another experience that I'm quite excited about is my first-ever jazz concert! I've always wanted to try this ever since I came to the States. Thanks to Juilliard, I was able to take Jazz History and Practicum classes at school. I love jazz. I'd love to do more jazz in the future. Such opportunities would never have come my way if I hadn't studied at Juilliard. Back home, the network is still quite limited. In Azerbaijan, we don't have access to many of these possibilities. Even though there are many gifted young people in Azerbaijan, they need opportunities to share their talents internationally. Not long ago, I went to Barbados. I must have been the first Azerbaijani musician ever to perform there. People were so fascinated by me. It seems there's a famous disco there called "Baku". The owners came up with that name because the people of Barbados call themselves "Bajan", which is very close to Azer-Baijan!!! This past May, I graduated from Juilliard with my Master's degree. It marked a milestone for me and the beginning of new choices in my life and career. I hope to be able to pass along some of what I've learned to young musicians in my country. The development of our nation depends upon young people having opportunities to learn and achieve. In the meantime, I want to express my deepest gratitude to all of the people who have helped me: my parents, teachers, friends, members of the international business and diplomatic community back in Baku and everyone who has believed in me and supported me. (It would take a whole page to name all of them!) Thank you very much. Violinist Sabina Rakcheyeva graduated from Juilliard with a Master's degree in Music in May 2002. To learn more about Sabina, see "Youth at Work: Sabina Rakcheyeva" in AI 7.3 (Autumn 1999) and "Sabina and Her Violin" in AI 8.3 (Summer 2000). SEARCH at AZER.com. Listen to samples of her violin at MUSIC. Sabina may be contacted at sabina_rakcheyeva@hotmail.com.